A guest post from Jane Fae picking up on the Paddy Power story that Helen G blogged about on Sunday. How do you solve a problem like…Paddy Power? Is it time to consider more draconian sanctions for businesses happy to play with violence against women and minorities as part of their promotional efforts? For those who haven’t heard the name, this is a firm of bookmakers from the Republic of Ireland that have made it big over here. They have also just launched an advertising campaign widely condemned as offensive, misogynistic and transphobic. Its based on the idea that for Ladies’ Day at this year’s Cheltenham races, they will send a number of trans women into the crowd: punters are challenged to spot the “stallions” (trans women) from the “mares” (“real” women), while taking care not to be taken in by the “dogs” (any woman who does not live up to “acceptable” standards of femininity). Outraged response has been swift and predictable. Equally predictable, the response of Paddy Power – the founder of the company – that nothing bad was meant by the ad and its just “a bit of mild mannered fun”. The “craic”! This is disingenuous. His company has a long history of giving offense. They have previously given us the most complained of ad of 2010, mocking the efforts of a team of blind people haplessly playing football. There was the Hollywood style sign they erected near Cheltenham racecourse, without consent, on an area of natural beauty. Then there was controversy over model Imogen Thomas, decked out as a referee under a caption reading “Blow me”. This is not an organisation that respects ordinary standards of decency – or women. Still, though, UK advertising has a fine tradition of using offense as a means to leverage ad spend and elevate public profile: just think FCUK. So what’s the problem? In this case the ad campaign is an accident waiting to happen: as trans and women’s groups have complained, its encouragement to drunken visitors to Cheltenham to “out” those who “might be trannies” is just asking for trouble – of the most violent kind. The cynicism of Paddy Power (the man!) is evident in his non-response to questions I put to him. Happy to chat good-naturedly about the collaborative nature of this campaign, he suddenly went all coy when asked about the potential for violence. So now Advertising Standards and Gloucestershire Police are running round like the proverbial headless chickens, trying to decide whether more damage will be done by banning or not banning the ad. For Paddy Power, this is an each way bet: whether the ad runs or not, they have benefitted enormously. They have calculated that whatever happens – rap over the knuckles or token fine – its “worth it”. Which is why I believe the time has come to change the rules of the game. Offense is deplorable – but something that can and should be argued about in the appropriate forums. Where a company wilfully risks public safety – irrespective of how they do so – the available sanctions need to be much, much harsher. A ban, certainly. But not on advertising. Perhaps, instead, a ban on operating in certain spheres for a couple of years. Or a significant fine: something starting with seven figures. Because otherwise, we are going to see this sort of advertising again and again: Companies hiding behind the figleaf of “merely” giving offense, when actually they are doing far worse – risking the lives of the groups they target. 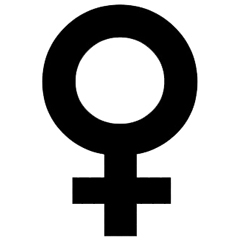 Public domain image of female symbol against white background via Wikipedia Commons.